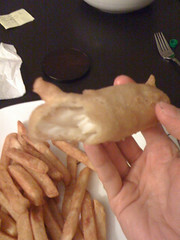 We just made the fish part and cheated on the chips (bought some frozen pre-made ones). Maybe we'll do the chips too next time. This is more-or-less the fish part of the Alton Brown recipe from foodnetwork.com. We scaled it down and modified it a bit to work with the 1.0lbs of cod we had. 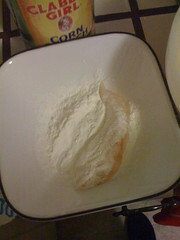 In a medium mixing bowl, whisk together flour, baking powder, salt, cayenne and black pepper. When combined, whisk in about 10 oz of brown beer. Mix until smooth. Let rest in the refrigerator for at least 15 minutes. Heat a quart of cooking oil to 350°F in a deep medium saucepan. 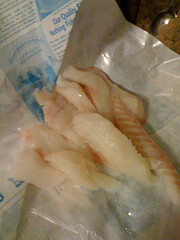 While the oil is heating, cut 1lb of cod into about 1 1/2 oz strips. 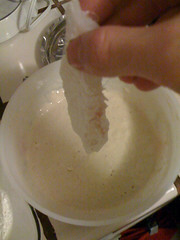 When the oil is hot, dredge the cod in corn starch, shaking off any excess. 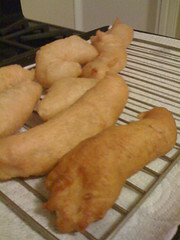 Submerge the starchy fish sticks into the batter one at a time, allowing excess batter to drip off before dropping into the hot oil. 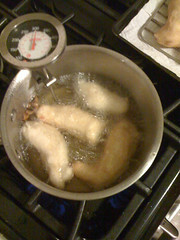 Once the fish is in the oil, allow the batter to set, then flip intermittently to evenly fry each side (the fish will probably float if you have enough oil). 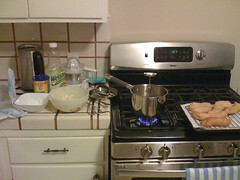 Fry the fish in small batches, making sure to re-heat the oil to 350 between each batch. This is what our assembly line looked like. When it is a golden brown color (about 5-6 minutes), remove it from the oil and put it on a drying rack to drip. Eat as soon as possible, or keep in a warm dry oven so the batter stays crispy.